Large dog breeds reach adult weights of 50 pounds or more, and they need big nutrition to match! We’ve researched a variety of best-selling products to compile these best large breed puppy food reviews so you can compare your options more easily. The list of features below is the first step in helping you compare dog foods to find the best option for your pup! Food Type - Dry and wet foods each have their own benefits and drawbacks that can make one preferred over the other. Breed Size - Some puppy foods can are specifically made for large dogs, while others are made for all breed types. Package Size - Knowing how much you’re getting is the easiest way to compare value across different brands and options! Dehydrated - Dehydrated dog food is a form of raw or holistic dog food that has been dried to help extend its shelf life. Main Protein - Chicken is the most common, but there are a variety of different options out there, like lamb, duck, and fish! Made In - We chose dog foods that are made in the USA because of the strict quality standards and factory regulations. Our large breed puppy food reviews are officially underway! Check out the top pick and budget pick if you’re in a hurry, but keep reading to discover a variety of amazing options for your pup. They’ll be happy, healthy adult dogs before you know it! AvoDerm is known for supplementing their pet foods with real California avocado for their omega fatty acids. 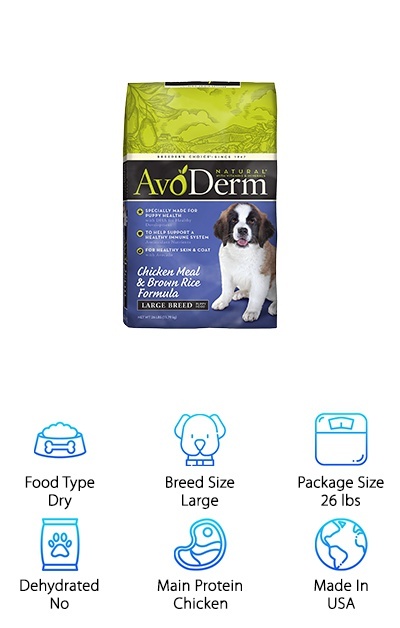 Our top choice in our large breed puppy food comparison is AvoDerm’s Large Breed Puppy Formula! Chicken meal provides the main protein source, and the kibble recipe contains no animal by-product meals, so you know your pup is getting high-quality protein to build strong muscle. Omega fatty acids don’t just help encourage a soft, glossy coat--they also help with a puppy’s cognitive development, too! This dry dog food has no corn, wheat, or soy, but plenty of nutrition. Supplements and nutrients provide the support your pup needs for a strong immune system, bones, and joints. AvoDerm offers natural and grain-free dog food formulas that appeal to a ton of pet owners. They also have an adult large breed recipe once your puppy is all grown up! 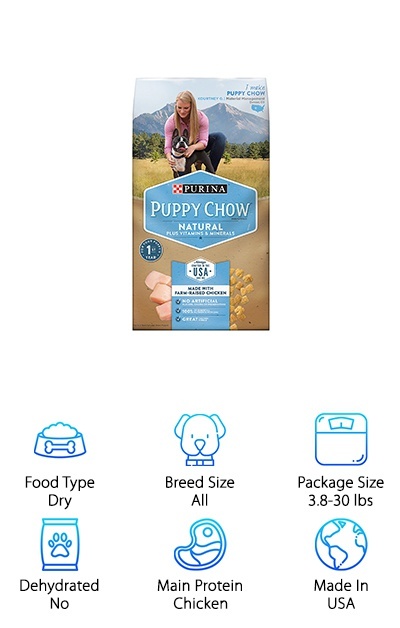 Our choice for the best large breed puppy food with a low price is Purina Puppy Chow, available in a natural recipe formula made in the USA. 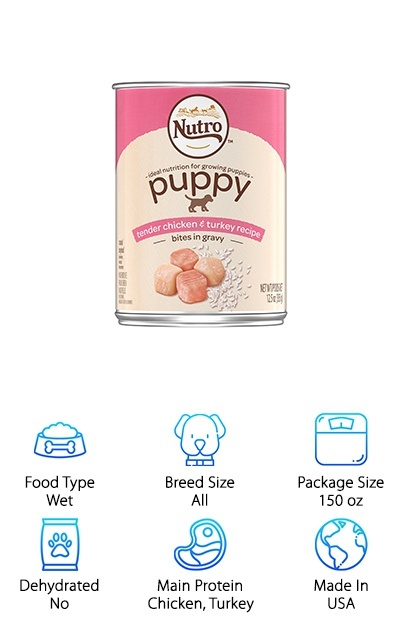 Made with chicken by-product meal and chicken, this puppy food also contains a variety of vitamins and minerals to support their development. This includes the omega fatty acid DHA, which is needed for cognitive development. This recipe has no artificial colors, flavors, or preservatives. The crunchy kibble comes in a mix of shapes to help keep your pup chowing down until their dish is licked clean! 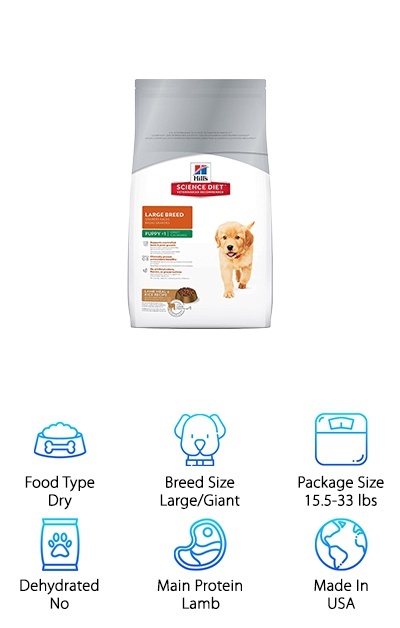 This dry dog food can be fed to puppies of all breed types, including to large breed puppies for up to two years depending on their growth period and adult weight range. If you’re raising multiple puppies from different breeds, being able to feed them all one kibble can help simplify mealtimes! Nutro Wet Food for puppies is ideal for weaning puppies thanks to the delicious flavors and juicy textures. The chicken and turkey recipe in gravy starts off with chicken broth, chicken, chicken liver, turkey, and beef liver as flavorful protein sources. You won’t find corn, soy, or animal by-product meals on the ingredients list, either! This wet dog food comes in a 12-pack of 12.5-ounce cans and is also available in recipes like chicken pate, lamb, and lamb and gravy. Vitamins and supplements provide complete support and nutrition for healthy growth. Why recommend a wet formula as some of the best food for large breed puppies? You can transition from milk to kibble more easily with a tasty and moisture-rich wet dog food helping the process along. This all-breed puppy food also works well for weaning puppies of different breeds at the same time. 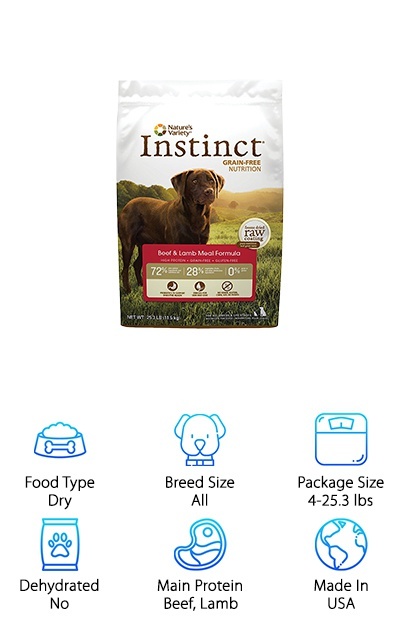 Nature’s Variety Instinct Grain-Free dog food can be fed to puppies, adults and senior dogs of all breed types. A coating of freeze-dried raw ingredients provides an extra boost of flavor to this natural dog food. Beef meal, lamb meal, and turkey meal provide delicious high-quality protein from multiple sources. Fruits and vegetables combined with vitamin and mineral supplements ensure complete nutrition from nose to tail. Plus, probiotics help ensure healthy digestion! Although not specifically a large breed dog food, this recipe from Nature’s Variety has an above-average crude protein level of 35% that can work well for active large breeds to help them build lean muscle. Omega fatty acids support cognitive development as well as a soft, shiny coat. If you’re looking for a protein-rich dog food that you can continue to feed to your fully grown large breed dog, Nature’s Variety is a great choice! Looking for a delicious wet dog food your large breed puppy will love? The Canidae Large Breed Puppy Formula can be fed as a complete diet or mixed with dry kibble. Puppies between 4-8 months should be fed two cans per 20 pounds of body weight per day. This package comes with twelve 13-ounce cans in a chicken, duck, and lentils recipe. Chicken, duck broth, duck, and dried egg whites provide delicious protein, while brown rice, pea flour, and lentils provide fiber-rich complex carbohydrates for energy. Wet food can be a great way to help your puppy transition from milk to solid food, although it can be difficult to feed large breeds a canned-only diet. This recipe is free from corn, wheat, and soy, making it a high-quality choice for feeding to large breeds! 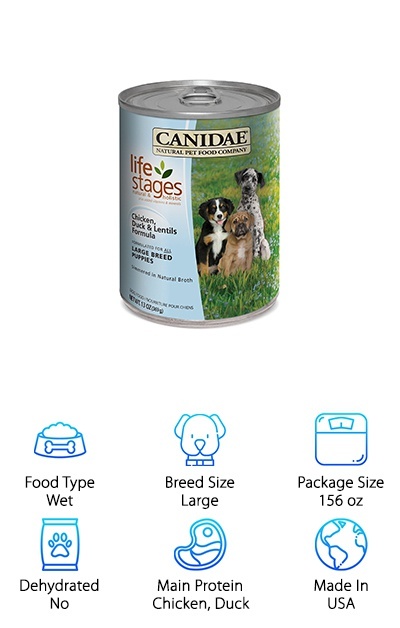 This Canidae wet dog food is a top pick for the best puppy food for large breeds that comes in a can! 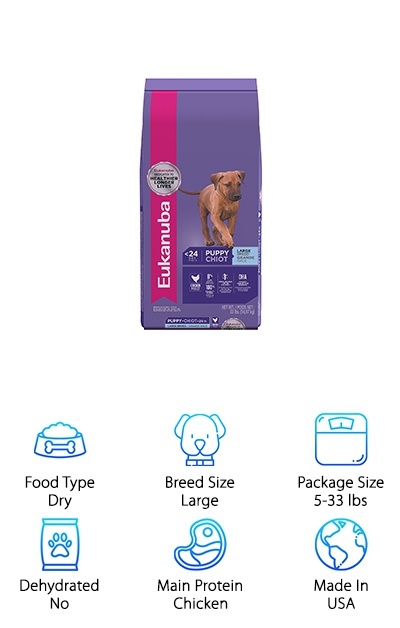 Eukanuba offers large breed puppy food in 5-pound, 16-pound, and 33-pound bags to suit a variety of needs. This recipe features chicken as the main protein source with a focus on providing the vitamins and minerals your pup needs for healthy growth. The omega fatty acid DHA from fish oil helps support cognitive development, while glucosamine, chondroitin, and calcium encourage strong bones and joints. Fiber from natural beet pulp and prebiotic FOS helps them fully absorb nutrition and keep digestion going smoothly. The combination of delicious flavor and complete nutrition make this some of the best dog food for large breed puppies. With a crude protein content of 26%, your puppy will have everything they need to build and maintain lean muscle during days full of play and learning. The large package size options can help you get a great value, too! The Hill’s Science Diet offers some of the best large breed dog food for every stage of your dog’s life, including everyone’s favorite: the puppy stage! This Lamb Meal & Rice recipe has a great start with lamb meal as the first ingredient, which is a protein that’s easy to digest and gentle on the stomach. Supplements of calcium, glucosamine, and chondroitin support strong bones and joints, a crucial factor in the healthy growth of a large breed puppy. An antioxidant blend, including vitamins C and E, help to keep their immune system strong. Made with easy digestion in mind, this kibble is a great way to wean your puppy to solid food. And it all comes together in factories based in the USA with ingredients from North America, Europe, and New Zealand. With no artificial colors, flavors, or preservatives, your pup can get high-quality nutrition that you can be proud of! 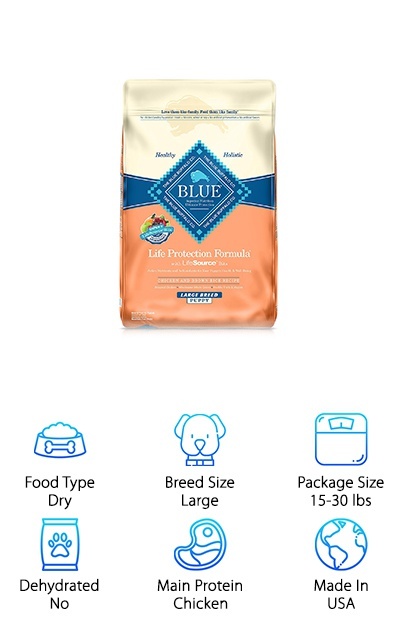 Blue Buffalo Life Protection provides a chicken and brown rice recipe made for the specific needs of large breed puppies. The first ingredients are deboned chicken, chicken meal, brown rice, and barley. You won’t find any by-product meals, corn, wheat, soy, or artificial colors, flavors, and preservatives in this kibble! If you’re looking for the best puppy food for large breed dogs, Blue Buffalo should be on your list to compare. With plenty of DHA and other omega fatty acids, this kibble helps to support healthy cognitive development. Fiber and probiotic supplements help to keep your pup’s digestive system happy and functioning well, while a bunch of vitamins and minerals provide support to their bones, skin, and immune system. This kibble also has a higher-than-average protein content at 28% to help support building and maintaining lean muscle. Your search for a holistic large breed puppy food stops here! 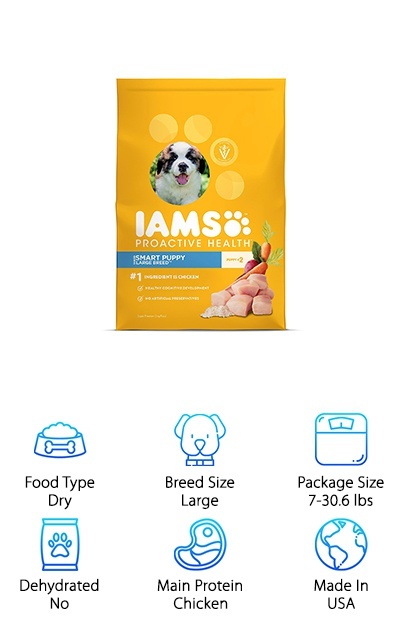 Iams Proactive Health offers a recipe formulated just for puppies in large breed categories. Especially with large breeds, getting a great value can be important when they’re eating tons of kibble every day! This Iams recipe offers chicken as the main protein source along with a mix of supplements and vitamins to help support your puppy’s health. DHA, an omega-3 fatty acid, helps to support healthy development of the brain and nervous system, and antioxidants support the immune system. This kibble is free from soy, wheat, and artificial dyes and preservatives. Plenty of carbohydrates and protein help your dog stay active. Dried beet pulp provides fiber to keep their digestive system moving along smoothly. Choose from 7-pound, 15-pound, or 30.6-pound packages depending on your puppy’s needs. This dry dog food offers a complete range of vitamins and minerals to help support every aspect of your puppy’s development! 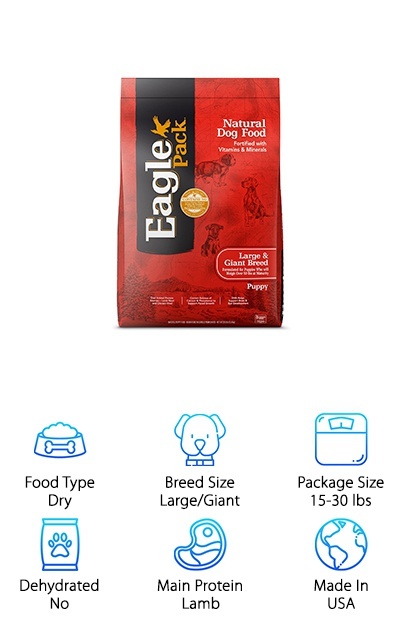 Eagle Pack Natural Dog Food for large breed puppies is rich in natural ingredients and made in the USA, too! It uses a larger kibble size than typical puppy foods and is designed to meet the growth needs of large and giant breed puppies. The main protein source is lamb meal, which is easy to digest and gentle on your puppy’s stomach, with chicken meal providing additional protein. There are no animal by-products in Eagle Pack foods, so you know your pup is getting high-quality protein! Rather than sourcing carbohydrates from corn or wheat, this dry kibble uses barley and rice as healthy sources of complex carbohydrates and fiber. Probiotic supplements provide digestive support, while omega fatty acids and DHA support healthy growth. This large breed puppy food is a high-quality choice that can help give your pup the solid nutritional foundation they need to grow big and strong!